(USAToday) -- Condoleezza Rice has said no way to the idea of being Mitt Romney's running mate every which way she can, but a Drudge Report story that she's the "front-runner" for the job has sparked lots of chatter. Some conservatives aren't thrilled with the idea of the former secretary of State as the vice presidential candidate, and they said so clearly after the Drudge Report came out with its headline last night. "I don't know who is hitting the crack rock tonight in the rumor mill, but bull shiitake mushrooms," wrote Erick Erickson on his RedState blog, as he denounced the speculation about her as "silly." Two points Erickson raised: Rice supports abortion rights (and has called herself "mildly pro-choice"). She also spent eight years working for George W. Bush, who is the least popular ex-president alive, according to a CNN/ORC poll. Katrina Trinko, writing in National Review Online, said she was surprised at the idea of Rice as Romney's running mate. 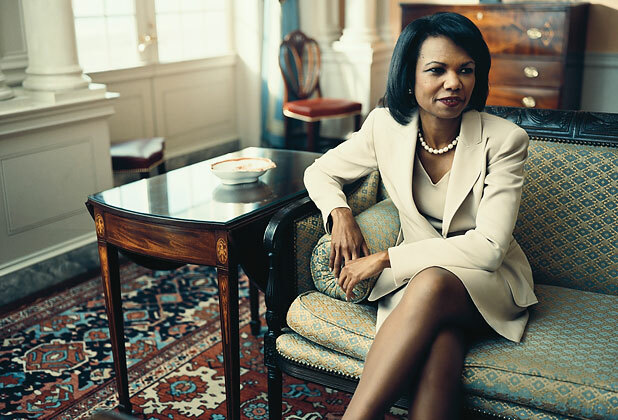 She noted Rice's years in the Bush Cabinet would "seem likely to generate controversy" and said there isn't a group of voters "she would automatically attract." "This is bad politics," said Mark Levin, a conservative radio host. Sarah Palin, the 2008 GOP vice presidential nominee, said on Fox News last night that Rice would be a "wonderful" vice president. And while the former Alaska governor said she would prefer "a presidential and vice presidential candidate who had that respect for all innocent precious purposeful human life," Palin said the job of legislating on abortion falls to Congress. On the flip side, Rice was said to wow Romney supporters with her speech at a recent gathering of fundraisers at a retreat in Park City, Utah. She was also the top choice of Republicans in a CNN poll, taken in April, on who they would like to see as Romney's running mate. Peggy Noonan, a former Reagan speech writer, wrote in the Wall Street Journal that she recently told a gathering of business people that Rice would be a "brilliant choice." "Spontaneous applause burst forth," Noonan said. I do not agree with Dr. Rice on everything but I definitely respect her. But I think that respect level would diminish some if she were on the ticket because Romney is proving himself to be shifty and desperate. He is not even coming across as a man of conviction. For her to be #2 to him would make me wonder about her and I would like to continue to esteem her.